The Sierra Nevada is the only ski resort in Andalucia is located at Pradollano in the Sierra Nevada Mountains about 30km from Granada city. Sierra Nevada is also the name of a large National Park with is popular with walkers and tourists especially in the summer months. Read more about the Sierra Nevada Natural Park. This page refers to the Sierra Nevada as a ski resort. The Sierra Nevada ski resort features ski chalets, hotels and apartments idea for anyone looking for a ski or snowboarding holiday. A visit can be combined with a trip to Granada city and the famous Alhambra Palace. This is Europe's most southerly ski resort, it is small in comparison to other European resorts. it is at higher altitude than most and the air tempurature is higher than most. There is also an active nightlife in the resort, iin tune with Andalucia more than most Eurpoean Ski resorts. The facilities are considered first class and it has hosted numerous national and international ski and snowboard events. Read the history of this resort. 3 to 5 star Hotels and Apartments in Sierra Nevada at bargain prices. We also offer classes, equipment and direct transfers from Granada and Malaga airport to Sierra Nevada or any destination in Andalucia. English speaking drivers. Depending on the snow levels, the season generally runs from the end of November or the beginning of December until the end of April or early May. There is a surprisingly active nightlife in the Sierra Nevada resort. Spaniards have a reputation for being night owls and this it often attributed to a hot climate that encourages people to lie low during the day and come out only once the cool of the evening has set in. However, the winter scene at Sierra Nevada contradicts this - or at least proves that old habits are hard to break. Most skiiers and visitors to Sierra Nevada come from Spain - mainly Madrid and the cities of Andalucía. According to the statistics from 2009/2010, over 90 per cent of those using the facilities at the ski station were Spanish. Out of the foreigners skiing in Sierra Nevada only 6 per cent were British. You would do well to carefully plan your ski holiday in Sierra Nevada, keeping in mind that the last week of February children from schools across Andalucia have one week off school, presumably to enjoy the snow and go skiing, which is why it's called "White Week" (Semana Blanca). Most children don't actually get to go skiing, but February is reported to be one of the busiest months, so beware. Also, as would be expected weekends and banks holidays are particularly busy. Look no further for your snowboarding or ski holiday.Whether it’s a more luxury hotel experience that you prefer or a cheap skiing holiday deal or package that you require, the Sierra Nevada ski resort in southern Spain will provide you with what you’re looking for. The Sierra Nevada ski resort and ski station are easily accessible from both Granada or Málaga provinces. From Granada, it is 45 minutes by car or bus from Granada´s Estacion de Autobuses just south-east of Granada city. 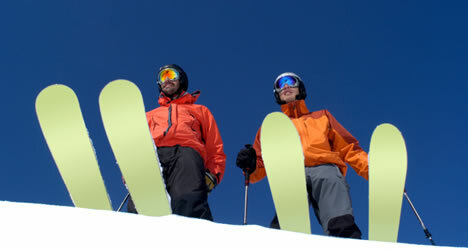 Sierra Nevada ski resort is about one hours drive from Granada Airport. If you're coming from Málaga airport, the ski station is about two hours drive. Follow directions to first to Granada and then to the Sierra Nevada "Estación de Ski". It is posible to drive on the mountain road all year to the resort village of Pradollano. The road is kept open, occasionally after heavy snow falls snow-chains are required, they can be purchased in local petrol stations. There is almost no available street parking in Pradollano, there are underground public (pay for) car parks.